In our last post I shared about all the images of mine that have been stolen over the years, and showed you some examples. In this post, I will talk about one option you have if this happens to you. I’ll cover how to do a DMCA takedown request. DISCLAIMER: I AM NOT AN ATTORNEY. THIS IS NOT LEGAL ADVICE. IF YOU FIND THAT YOUR IMAGES HAVE BEEN STOLEN, PLEASE SEEK THE ADVICE OF A COPYRIGHT ATTORNEY. THIS POST IS SHARING MY EXPERIENCE WITH YOU AS I LEARN MORE ABOUT THIS TOPIC AND FILE MY OWN DMCA TAKEDOWN NOTICES. 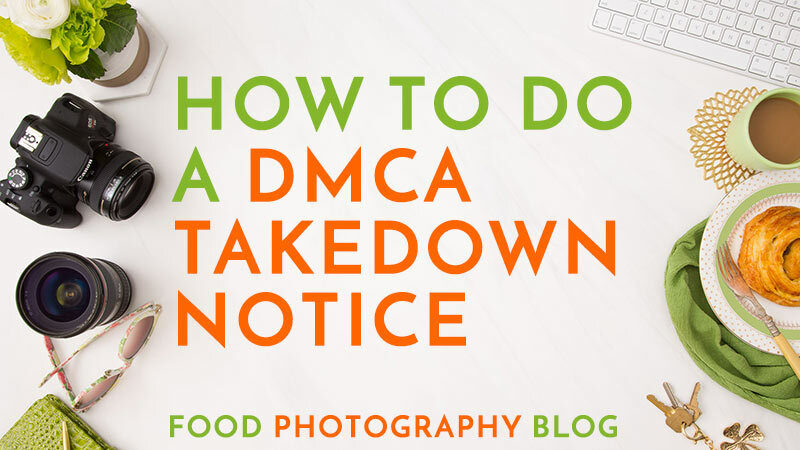 Should You File A DMCA Takedown Notice? It must be said that not everyone taking your content without permission is doing so in a malicious manner. There are 100’s of sites that have taken my images without permission. Many of them are fully giving me credit for my work, and linking back to my blog, and many times linking back to the blog post they took the images from. Though they absolutely should have asked permission, when the site is not using my images to sell their product, but is actually another blog giving me credit, I let it go. Maybe I’ll get some traffic out of it. 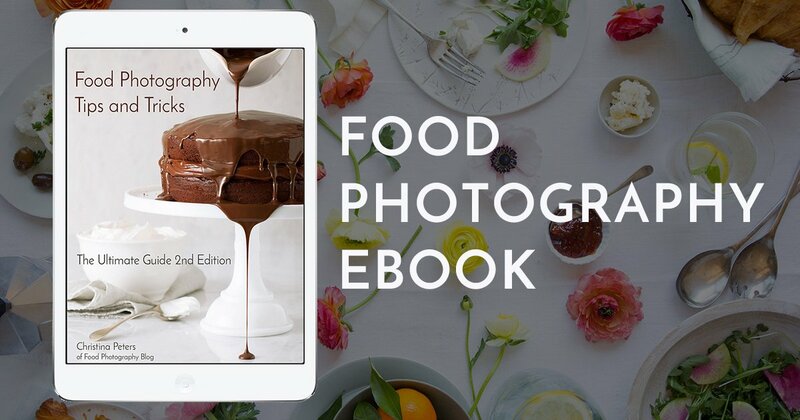 There are many food bloggers trying to teach food photography, and they link back to my site in their blog posts. I let those go as they usually give my blog credit. When they try to use my images to sell their food photography workshops or programs, I shut that down fast. That’s false advertising, and they are using my images to try to make some money. That’s where it crosses the line. 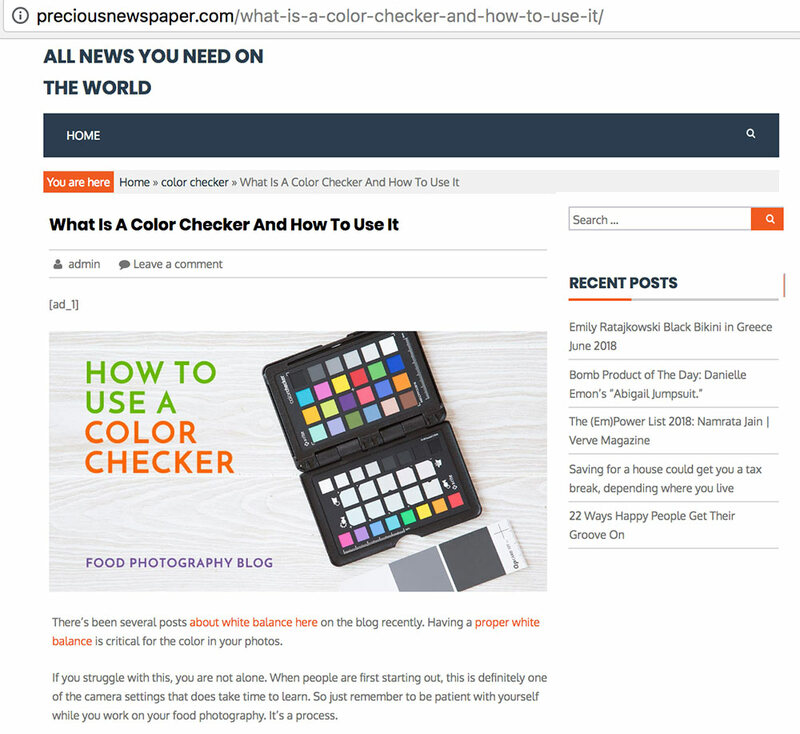 So, if you’re a food blogger and find your images on another blog where they acknowledge you, your work, give you credit and link back to you, then it’s probably not worth your time to send them a notice, and hopefully it could give you some extra traffic. If they are using your images without credit, you could just try reaching out to them and ask them for photo credit, and a link back, and if they don’t do that, they need to take the image(s) down. If they don’t respond, or choose not to give you credit, then they get a DMCA takedown notice if the infringement continues. If it’s one of those disgusting scraper sites, like this one below that takes my entire blog posts – that is NOT ok.
Again, these are just my suggestions,s so if you are dealing with your images being stolen and just don’t know what to do, please look up a copyright attorney in your area to have a consultation with them. What Does Fair Use Of An Image Mean? There is also something called Fair Use of any copyrighted material, unfortunately. This means if our work is used in the manors described above, it could be considered Fair Use of our work. Depending on the specifics, we might not be able to do anything about it. Let’s talk about what the heck this is. DMCA stands for Digital Millennium Copyright Act and it was created in 1998. It’s a group of laws whose purpose is to help protect your copyrighted digital content. It outlines a formal process to get your infringed content removed from a site that is not authorized to use your content. There’s obviously a lot more to it than that, but hopefully that gives you a good idea of the purpose. Your contact information, mailing address, and phone number. Website links to the infringed work. Website links showing where they stole the content from – the original source. A statement of “good faith”. Meaning, you absolutely believe the website using your content was not given permission to do so. I also add a statement asking the host to please help me in removing my content from the infringers website. You must sign it. Digital signatures are accepted. You don’t have to use a service to create or send a DMCA takedown notice. You can create your own notice and send it yourself. Here is a great website I discovered that has a free DMCA template, and a DMCA generator for you with lots of info. The site is www.whoishostingthis.com. They have a DMCA generator for you to use. I’ll probably start using this soon. Where Do You Send The DMCA Notice? This can be the tricky part. You should send your notice to the website owner. If you can’t find the owner, you can send this to the host of the infringing website. Here’s the deal – the bad sites hide all this info. There are no contact forms. You can try to look up the website owner, or the host information by using a “Who Is lookup” tool. This one is pretty good and gives you a lot of info: www.whois.domaintools.com. If you find the host, that’s great – look for an email address that starts with “abuse”. If you don’t see any email info in the search results, go to the host of the website and look for “Contact”, “DMCA”, or “Copyright”. Many hosting sites have their own DMCA pages with a form you can fill out. Others have instructions of what to include in your notice, and where to send it. Here’s the tricky part. Many of the bad sites hide behind a service named Cloudflare. They offer security to websites (and other things) – the problem is it also hides the website’s real IP address. This makes it impossible to find the real host and owner of a website. Cloudflare has been sued many times for aiding in copyright infringement, because they won’t share info about who is the real host of the websites using their service. It’s called Contributory Copyright Infringement. They just pay up – they settle out of court. So, you sent your notice to the infringer, or the host of the infringing site. Now what? You wait. If they are good peeps, they will respond within 24 hours to at least acknowledge your notice. Many times the host will respond within 24-48 hours with an update that they have removed the infringing material. If you are able to contact the website owner directly off of their site, they usually take the content down right away. These are the sites that have an easy way to contact them, or have their own DMCA or copyright page. Some hosts are awesome. My DMCA takedown notice has shut down entire sites, not just removed my page, but the whole site was shut down. Weebly is one such host. They were one of the best I’ve worked with so far. They literally respond to me within a few hours and take the entire sites off line. Good hosting companies will respond within 1-3 days. They will either remove the content, or tell you they have given the website owner 24 hours to respond. Then, if the site owner doesn’t respond, the hosting company will email me again to say they have removed the content. The bad hosting companies don’t respond, and do nothing, in which case, I have no idea what to do after that happens. About half the websites are hosted with these types of companies who just don’t care. There are services that say they can get your content removed, for a price. No idea if they are successful or not. No one guarantees anything, and I’ve not tried that yet. What If The Infringing Website Is A Business Using Your Image To Sell Their Product? Now, this is a different story. This type of infringement might actually be something you can pursue and get the infringer to pay you for that. That’s where I use an attorney (if it’s a major brand), or I’ll use an image tracking service like Pixsy or Lapixa to help me go after them. If you like this post or feel it can help a friend, please share it on Facebook and sign up on the right column to make sure you don’t miss another post.